We are so excited to welcome you to SIUE. We know how difficult it is to pack up your life in two suitcases. We hope this advice will help you avoid additional baggage fees and make your first weeks in Edwardsville more comfortable and convenient. Travel documents are more important than anything else. Your passport, I-20 and any other form of identification are what matter most. If you plan to drive in the United States, bring your international driver’s permit with you. Put important documents in your carry-on bag and guard it carefully! Edwardsville is a city which gets all four seasons, so pack accordingly. Summer can be hot and humid. Bring comfortable shorts, skirts, flip-flops and other summer wear. In the fall, things cool down, and by this time, a warm jacket is recommended. Winter is cold, and wearing several layers, a warm jacket, snow or water proof shoes, and full length pants/jeans are a necessity. Spring is beautiful, and generally, a light jacket in the evenings is more than enough. If you ever find you need to do some shopping, there are plenty of stores within a short distance of campus. During orientation, we will take you shopping to pick up supplies. We recommend packing a carry-on bag with a change of clothes, toothbrush/toothpaste, snacks, any required medication (in its original container) and other items you may need in your first few days in the United States. In some cases, lost luggage can take a few days to recover, so keep this in mind if there are things that you will need immediately. Winter Jacket: It is essential to have a warm jacket when it starts to get cold. There are many different styles and options, but a common choice among students are jackets stuffed with down feathers, which are available in waterproof material. Inexpensive choices can be purchased at stores near campus or ordered online. If you are arriving in January for winter term, you will need a jacket right away. Layering: Wearing several layers helps staying warm. Wear a combination of long and short sleeve shirts and sweaters under you winter jacket to beating the cold. Footwear: This is really an essential part of feeling warm. Warm socks and snow-proof shoes can make a huge difference. Scarves, Caps and Gloves: These are great additions which add that extra warmth, and help deal with the wind. Keeping your neck, ears and hands warm can greatly influence how warm you feel. Having a computer is very useful, though not absolutely mandatory, because the libraries on campus and other facilities have computer labs. However, since most of your classes have information, assignments online, and homework online, having a computer is very convenient. If you bring a device from home, you may need a plug adapter. The adapters may be cheaper to purchase in your home country before arriving. Carry some photographs, your favorite books or movies, or some packaged food from your home country. There are always those days when you want to share memories with your new friends, or just want to look back at some of the times you had before coming to SIUE. These things take up little space, and can give you that extra comfort in a new place. You may want to bring traditional clothing to wear to international events on campus. There are numerous stores near campus where sheets, pillow covers, curtains, rugs, clocks, mirrors and other things you might need for your room are available, so you don't need to carry all these from home. 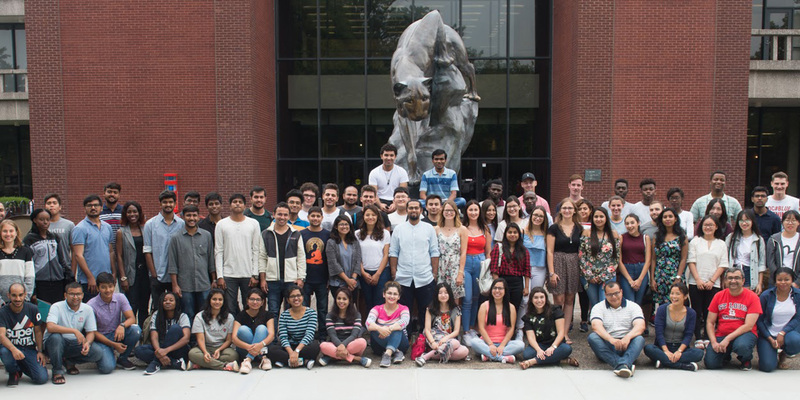 Additionally, the International Hospitality Program, a community group supporting SIUE international students, collects household goods such as dishes, blankets and small appliances, to distribute during orientation week. You will want to list all of possible expenses. If you are not sure what your expenses are, you might try tracking them for a week, a month or more. Recording everything you spend can be a great way to determine areas to cut out. Life can never be completely planned. If your car breaks down or you get sick, you’ll be grateful you have money saved in case of emergency and you won’t have to rely on credit. If you’re planning a spring break trip with your friends or have your eye on a new couch for your apartment, you’ll need to start saving for that expense as soon as you know about it. Consider reworking your budget to attempt to increase the amount you save every month. Finally, total your income and your expenses, and make sure your budget “balances.” This means you’re not spending more than you are making. You should either break even or, preferably, have some money left over. If your budget doesn’t balance, you’ll need to reduce your expenses and/or figure out a way to bring in more income.